The first state was the clergy. The second state was made up of the nobility. The rest of the society was included in the third state. More tan 90% of the society belonged to the third state. You were born in a estate you remain in the same social group. There were only two exceptions to that: marrying a noble – something really infrequent – or joining the clergy. Kings had lots o f priviledges extended to their families as well as they had absolute power controlling everything concerning the government. The Catholic church was very influential. They had special courts and collected taxes like the tithes – one tenth of the annual income paid to the church. On the other hand, they were excluded from paying taxes. The high clergy ( bishosps , abbots, cardinals, etc) were really rich and powerful. On the contrary, the low clergy ( priests , monks and noons ) faced miserable living conditions. 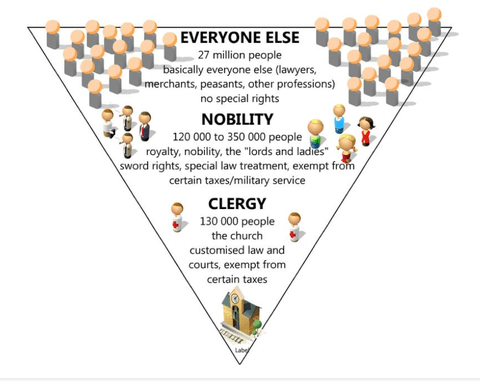 The nobility benefited from great privileges: they paid low taxes, they had large estates and vassals, they collected taxes from their farms they only could be judged in manorial courts. In the middle ages they were in charge of protecting the society and provide armies to the King. However in the 18th century they had the best positions in the administration as well as they also had a leisure life at the court. 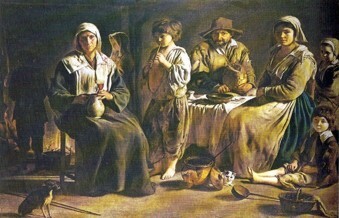 Peasants who lived in poverty and were the most numerous group. Urban workers – craftsmen, servants. The bourgeoisie who were a wealthy group including lawyers, bankers, merchants. Although the different backgrounds all the third state members has the same legal status. They did not had privileges or political power, they had to pay high taxes. Their social status began to be questionned as the bourgeoisie complained about paying high taxes and not having any political influence. They also were not satified with the fact that nobles and clergy did not pay as many taxes as they did.